Yesterday's snowfall was a record for the DFW area. The official total was 12.5"! School is out again today, so all the neighborhood the kids are having a blast playing outside. Here's my most recent fabric purchase. Well, this is some of it. I decided that since I missed out on Flea Market Fancy, I'm not going to miss out Katie Jump Rope. The stash above is from three different places with two more orders on the way. I was able to find everything with the exception of two of the dot prints (the yellow and the light blue/green). I want to make a quilt for my bed and it's king size. 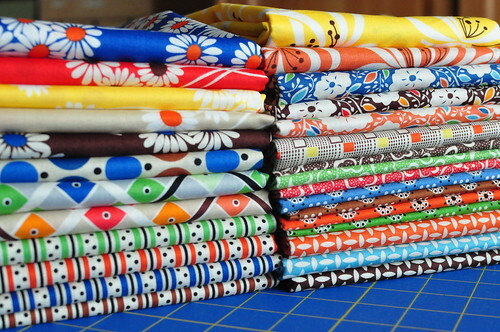 My dream pattern is the Single Girl quilt, but I've read that it can be a little on the challenging side. So, I've had this quilt at Wise Craft bookmarked for a while which has the same feel as the Single Girl pattern, but looks much easier. 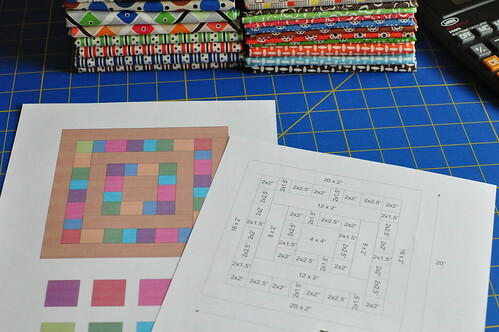 The pattern is called the Marquee Quilt and it's in the Modern Quilt Workshop book from FunQuilts. I ordered the book but decided I wanted to play with the fabrics right away. 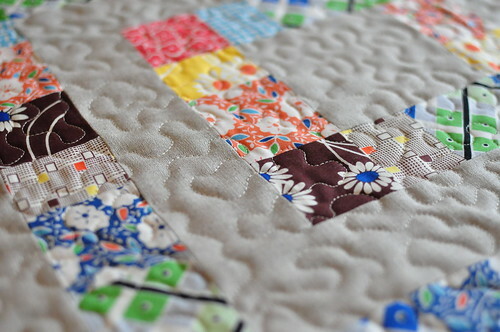 Using 100% linen on the front of a kind sized quilt may end up being much too expensive, but wouldn't it be gorgeous! I decided to try some of the fabrics with linen while I wait for the book to arrive. After some quick pattern drafting, I had a design that worked and feels a little like the Marquee quilt. I love the way the front turned out. Love it! I was tempted not to wash it, but I went ahead. It's in the washer now, so I'm anxious to see how it looks washed. Hopefully I'll have the pillow assembled tomorrow to show you. It is just absolutely beautiful!! Looks terrific with the linen. 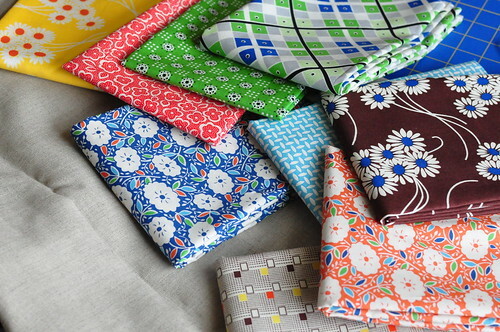 I am currently working with the Essex linen/cotton blend, that I stock in my shop, and it is wonderful. It washes up beautifully and comes in many different colors. I am anxious to see how the 100% linen washes. You did a fabulous job! it looks gorgeous! i love those katie jump rope fabrics. such simple colors, but they look so great together!